As the British Queen Elizabeth, she is the second of her kind. The first Margrete was a powerful regent that managed to unite Sweden, Denmark and Norway in the Kalmar Union. The second Margrethe is less powerful, but even more loved by her people as regent, and took over as queen when her father Fredrik IX died in 1972. 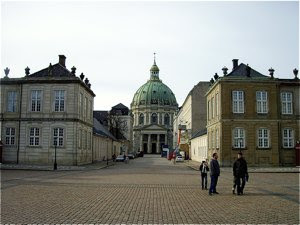 The Amalienborg Palace has been the home of the Danish monarchs since 1794 when the Christiansborg Palace burnt down. It has been a palace here since the beginning of the 17th century. 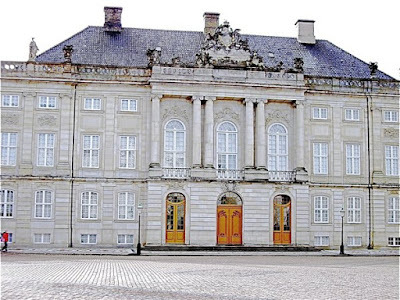 The Sophie Amalienborg Palace was built for Queen Sophie Amalie, queen-consort of Fredrik III. It burnt down in 1689. When Frederiksstaden was developed in the mid 18th century, the four townhouses that make up todays palace was designed. The site for each palace was donated free of charge to the chosen aristocrat to build on. All palaces should comply to the architectural specifications of the area. They are a beautiful complex, and when seen from the water, the dome of Fredriks Church (Marble Church) tower over the buildings. Just over the waters you have the view to another, and a much recent marvel of the Danish capital - its new opera house. And you may walk just through the palace grounds and get access to the harbour. If you are lucky, you may get a glimpse of the queen herself. If not, you may continue your stroll and end up in beautiful Nyhavn for a drink.